John's Facebook page is HERE. John E. Marriott is one of Canada’s premier professional wildlife and nature photographers, with images published worldwide by National Geographic, BBC Wildlife, Canadian Geographic, McLean's, and Reader’s Digest. John has photographed from coast to coast, from the arctic to the prairies and from Yellowstone to the Yukon. He prides himself on being a conservation photographer known for photographing wilderness scenes and wild, free-roaming animals in their natural habitats. In North America, grizzly bears (Ursus arctos) once ranged from the Pacific Ocean to the Mississippi River and from Central Mexico to the Arctic Ocean.Today, the prairie population of grizzly bears is locally extinct (extirpated) in Alberta, Saskatchewan and Manitoba. It was extinguished through human intolerance, market hunting, rapid conversion of habitat to agricultural fields, and loss of key prey (buffalo). Blue-Listed is defined as: Blue-listed species are considered to be vulnerable and "at risk"... Populations of these species may not be in decline, but their habitat requirements are such that they are vulnerable to further disturbances (Harper et al. 1994). The provincial government claims that there are lots of grizzlies in BC, so they can easily be hunted and are not a species of concern. 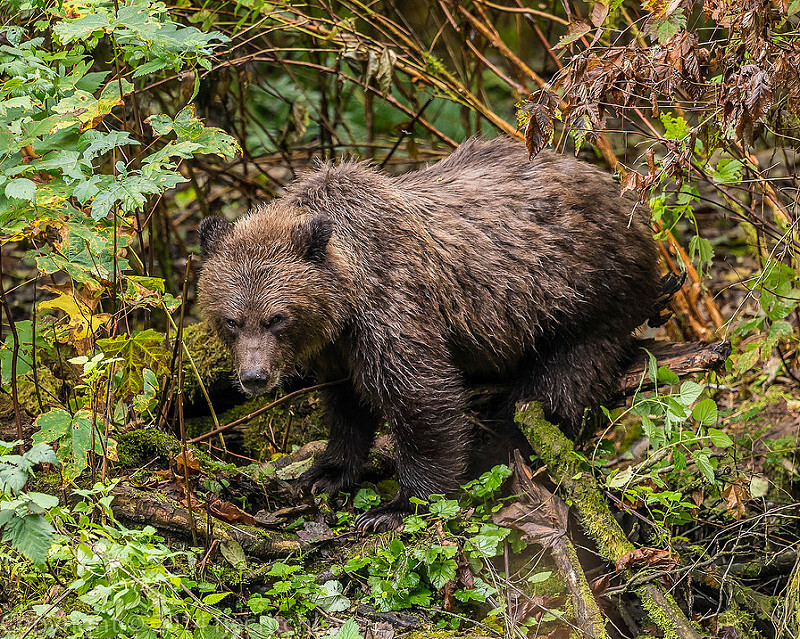 Environmentalists, wildlife biologists and concerned citizens claim the government count is faulty and the number of grizzlies in BC is an unknown. In 2016, when a sow and 2 cubs were relocated from Glade, the Conservation Officers were able to collar her only because the collar was donated to their office by a local biologist, not because it is standard issue. If the BC government was interested in getting their numbers right, one of the first things they could do would be to fund more research. VWS has been working with local concerned groups, including the Friends and Residents of North Fork, to save this small semi-isolated population of about 80 grizzly bears for the past 25 years. In 2007, partly in recognition of the need to protect core wilderness of high habitat value for these grizzly bears, the province established the Granby and Gladstone provincial parks. Despite this important conservation initiative, the province has tragically allowed accelerated road-building and clearcut logging of critical grizzly habitat and movement corridors between and around these protected areas. Unless the widespread logging is stopped, these southern dry land grizzlies are doomed. Much of this threat today is from BC Timber Sales (BCTS), owned by the province of BC. 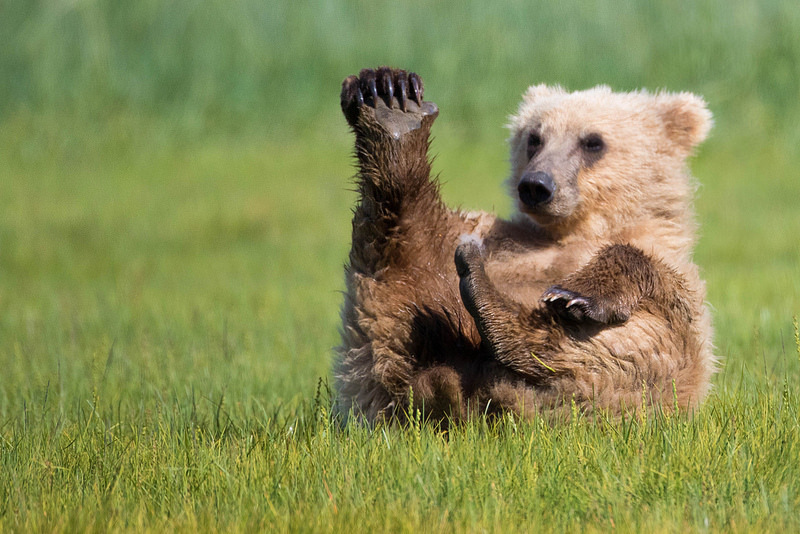 Grizzly bears have one of the lowest known reproductive rates of all North American land mammals. The age of first reproduction ranges from 5-8 years. A female produces young every 3-5 years. 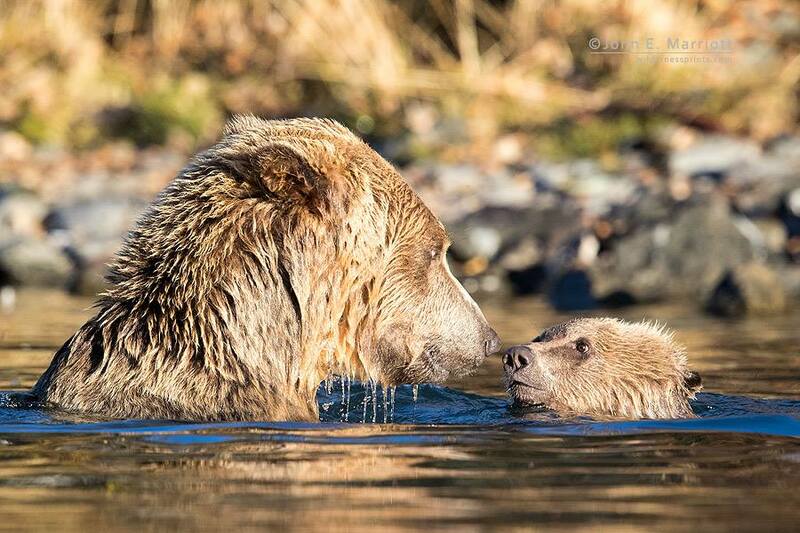 In mountain parks, research indicates that on average, female grizzly bears have offspring every 4-5 years. Mating takes place from mid-May to early July. Males will travel long distances to mate with available females. The most sought after grizzlies in hunting are the biggest males. 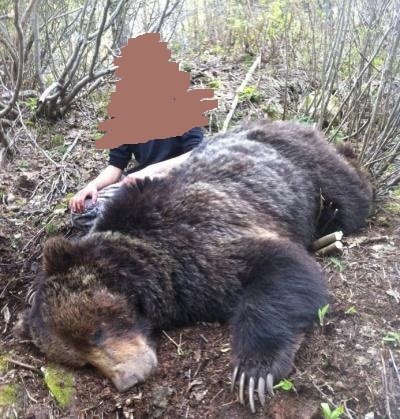 This picture (with identifying characteristics removed) shows a hunter with a male grizzly in its prime: shot, killed and skinned during mating season in the vicinity of a receptive female. The bear was about 7' tall, and approximately 14 years old. 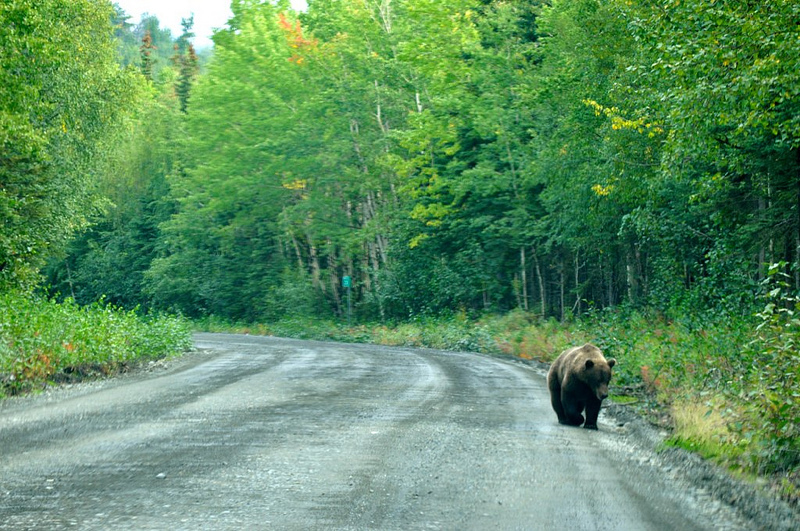 Hunters gain more access through roads established by logging companies. This is especially relevant in the Glade watershed where currently only a minimal number of roads exist, and a large portion of the watershed is solely accessible by foot. UPDATE: In Dec, 2017 the BC NDP government banned the grizzly bear hunt. The spring grizzly hunt season was scheduled to open April 1, 2018, but the government says the new ban takes place effective immediately. Under the new ban, First Nations will still be able to hunt for food, social and ceremonial purposes or treaty rights. This is one less pressure on the bears, but the destruction of their habitat is an ongoing issue. 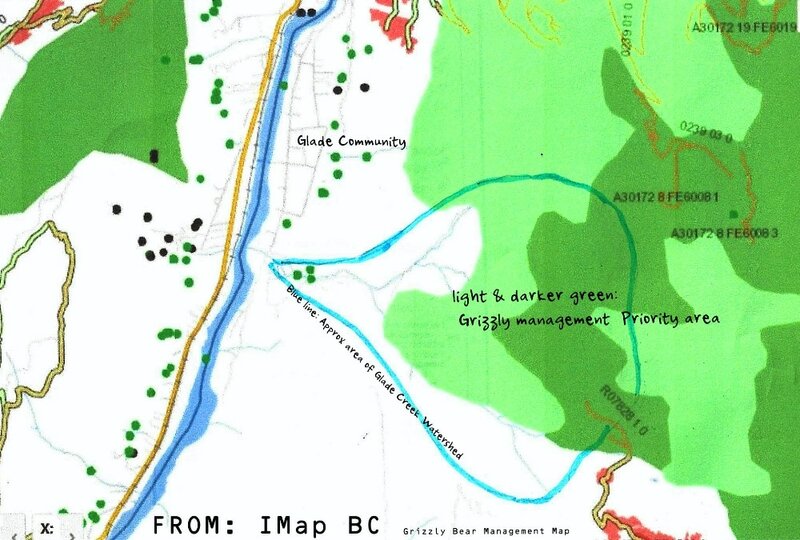 Green areas: Grizzly management priority areas. Locally, in Glade (2016), there was a grizzly sow and 2 large cubs (likely 2 year olds) that were in the community for a few weeks. Although she appeared to be keeping to wild food and not hunting the large number of sheep, goats, chickens, chicken feed, and calves in Glade, there was always that concern, and the danger of interaction between her and residents. The Conservation Officers took proactive measures. They managed to relocate her and her cubs together to another area nearby: they can not be moved too far, otherwise their survival rates drop. They collared the sow and tagged the cubs. 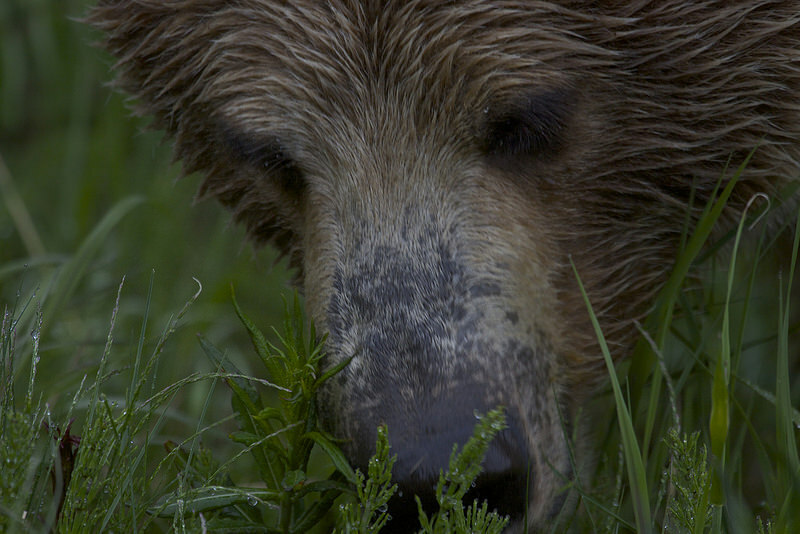 According to long-time residents of Glade, it is extremely rare to see grizzly in Glade. In addition to this family of 3, there was a male grizzly seen in south Glade. 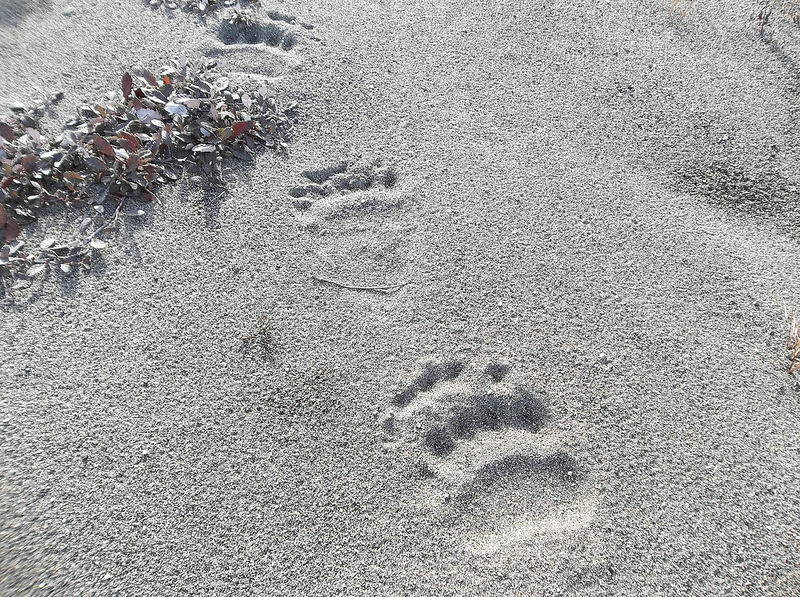 What events are causing these bears to move into areas that are not usually within their range? The Auditor General's Performance Audit Coverage Plan has commissioned a new report specifically on grizzly bear management: It will assess "Whether the Ministry of Environment and Ministry of Forests, Lands and Natural Resource Operations are effectively managing the grizzly bear population in B.C." change (part of a collaborative climate change audit involving legislative audit offices across Canada). Forest Revenue (Part 1) assessing whether the Ministry of Forests, Lands and Natural Resource Operations established necessary controls around timber harvest volume information to mitigate significant risk of revenue loss. This signifies a new interest in the topic of climate change and forestry in this province. Feel free to contact that office in regards to any of these current and future projects to state your concerns. Trans-border Grizzly Bear Project: "We are an International group of biologists working to recover the trans-border threatened South Selkirk and South Purcell/Yahk grizzly bear populations. Both these populations are legally designated as threatened by the Province of British Columbia and the US Fish and Wildlife Service."